OK, so it'll take more than revving a DeLorean up to 88mph to suspend your disbelief, but bear with this: Doc Brown, he of Back to the Future: Part III fame (kidding, everyone knows he was famous from that DirecTV commercial) said he wants to throw out the first pitch of the World Series if the Chicago Cubs make it there. 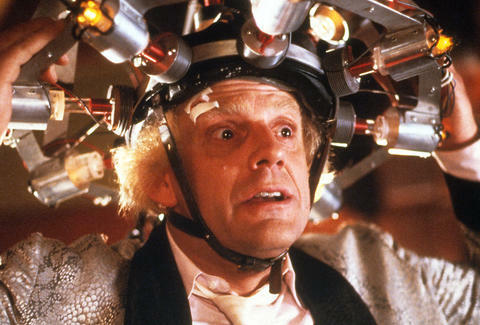 Actor Christopher Lloyd talked to the Hollywood Reporter about renewed interest in the series leading up to Oct. 21, 2015, known now as "Back to the Future Day," the date Marty McFly landed in the future in Back to the Future: Part II. "I didn't even remember about the Cubs until someone brought it up a few days ago," Lloyd told THR. But the 77-year-old actor said he'd be interested in tossing out the first pitch for a Fall Classic including the Cubbies. "Maybe it'll happen. We'll see. They got to get there first." Ryan Craggs is Thrillist's Senior News editor. He watched a lot of Cubs games on WGN growing up and lived in Chicago for a couple years. Follow him @ryanrcraggs. If your memory is fuzzy, well, this matters because one the major plot points of Back to the Future: Part II sees Marty (SPOILER ALERT FOR A 26-YEAR-OLD MOVIE) gamble on the the past after he learns the Cubs win the World Series in 2015. For those of you keeping score at home, the Cubs have not won the World Series since 1908, making this joke from 1989 all that much more hilarious, or sad, if you're a Cubs fan. The Cubs, of course, would still have to advance past the New York Mets in the National League Championship Series. Right now, they're 7/4 favorites to win it all, tied with the Toronto Blue Jays. Stranger things have happened. Like, the entire use of prosthetics and trick filming to replace Crispin Glover in Back to the Future: Part II.